These are the tools every natural hoof trimmer needs! Whether you are a full-time hoof trimmer, or only trim your own horses hooves every few weeks, there are critical natural hoof trimming tools you are going to need in your tool box. Note: This page is provided for information purposes only, and is not substitution for professional horse hoof care and training. 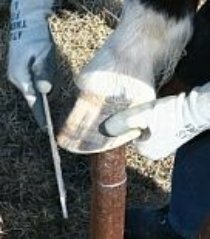 The pictures and descriptions below will give you a sense of what goes into natural hoof trimming. This is a Hoof Jack. It is commonly used by hoof trimmers to hold the horse hooves, and makes natural hoof trimming, or farrier work a lot less back-breaking. A Hoof Jack typically has interchangeable post attachments. 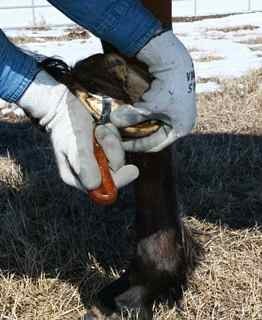 One with a sling that supports the leg while the hoof is pulled back, and another with a rubber cap that supports the bottom of the hoof for rasping the walls and applying a mustang roll. Hoof Jacks make it easy to keep tools in reach as there are magnets on the side that hold the hoof nippers and the hoof rasp when they aren’t in use. This also keeps them off the ground where they can get full of dirt, or stepped on by your horse! In the image you can see the hoof nippers held onto the green neck of the Hoof Jack by the magnet. A hoof stand can be used instead of or in addition to the hoof jack. It can be easier for a barefoot trimmer or farrier to have a separate hoof stand, and not have to worry about switching back and forth between attachments as they work with the horses. Here Josie’s hoof is up on the hoof stand, and a rasp in being used to shape her hoof. Having the stand to support her weight she feels more secure and relaxed so patiently stands while her hooves are being trimmed. Hoof Nippers are one of the key tools in a hoof trimmers tool box. They are used to trim the majority of the growth from the horses hooves. The operate in the same fashion as a pair of nail clippers that you would use to trim your own nails. 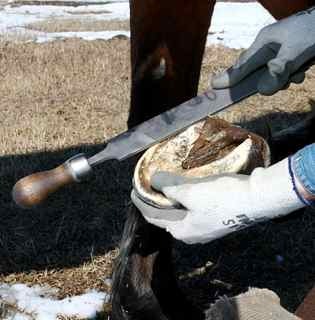 When held at an angle, many natural hoof trimmers also use hoof nippers to create a bevel around the base of the hoof wall that forms the beginning of the Mustang Roll. The Mustang Roll is the name given to the bevelled edge of the hoof wall, that is meant to mimic the wear patterns that wild horse hooves have. As domestic horses do not travel as much on the rough, varied terrain that wild herds do, trimmers must give them this wear pattern. A hoof rasp is a versatile tool that can be used to remove length from the hoof wall, as well as to smooth rough edges, and form the hoof into the desired shape. A hoof rasp is critical for creating heel bevels, as well as the rounded edge of the Mustang Roll. It is a metal file, like a giant nail file, with one course side, and a finer side for finishing. A hoof knife is another tool with many jobs when it comes to natural hoof trimming. It can be used for trimming the bars of the hoof, scraping out the sole (if it is ready to be exfoliated) and removing parts of the frog that need to be cleaned up. Many natural hoof care instructors teach that it is best not to trim the frog unless it is very unhealthy and has flaps that are creating an environment for thrush to live. For the most part though, healthy barefoot horses do not need to have their frogs trimmed. A hoof knife is not used to cut into the sole of the hoof, as it isn’t necessary to trim the sole. It will exfoliate itself, but the tip of the knife can be used to scrape away the chalk-like material in order to see where the sole plane is. This helps determine how much hoof wall can be trimmed off with the hoof nippers and hoof rasp.